Light leaks, winds meet where the waters spill deceit Reena Saini Kallat 2008-2010, metal, sacred thread, fly zapper with UV fluorescent tubes and electrified grid. Courtesy of the artist. Manchester is in for a veritable feast of Art, Music, Film and Performance with this multi site programme marking the 70th anniversary of partition and the creation of India, Pakistan and later Bangladesh. This September Manchester’s cultural institutions will welcome leading South Asian and British artists of South Asian decent in a celebration of shared heritage and historic connections through a series of exhibitions and performances across the city. Marking the 70th anniversary of the creation of India, Pakistan and later Bangladesh, eight exhibitions will present both new and seminal works, while a wider programme of music, film and performances for the opening weekend (29 September – 1 October 2017) will invite audiences to experience a wealth of South Asian culture. New North and South is a network of eleven arts organisations from South Asia and the North of England, supported using public funding by the National Lottery through Arts Council England’s Ambition for Excellence. The September exhibitions and events will take place at the Whitworth, Manchester Art Gallery, Manchester Museum, Museum of Science and Industry and HOME. Raqs Media Collective, Jeebesh Bagchi, Monica Narula and Shuddhabrata Sengupta, have been described as artists, media practitioners, curators, researchers, editors and catalysts of cultural processes. The exhibition Twilight Language (30 September 2017 – 25 February 2018) at the Whitworth and throughout Whitworth Park will, in the Collective’s own words, ‘unravel worlds, make questions, haunt memorials, and follow the tangled threads of how histories and ways of thinking about emancipation intersect.’ The extensive exhibition will present many works from Raqs Media Collective’s practice including The Necessity of Infinity (2017) Coronation Park (2015), The Things That Happen When Falling in Love (2010) and the video works Strikes at Time (2011) and Equinox (2012). The exhibition will include several new commissions inspired by Manchester’s history. Seven Indian Painters in Europe (1958) the exhibition will draw exclusively from the 1953-63 period, capturing the creative atmosphere of the time. Artists featured will include S H Raza, Akbar Padamsee, Tyeb Mehta, Paritosh Sen, Avinash Chandra, Anwar Jalal Shemza, Francis Newton Souza, Ram Kumar and Laxman Pai. Paintings will be supported by works on paper, exhibition catalogues and photographs by the renowned photographer Ida Kar. The exhibition is co-curated with Amrita Jhaveri, an expert in Modern and Contemporary Indian art, gallerist, author and collector. New North & South at Manchester Art Gallery will open solo presentations by five artists: Neha Choksi, Waqas Khan, Mehreen Murtaza, Hetain Patel, Risham Syed and host a one-off performance lecture from Tentative Collective. Neha Choksi’s new multichannel film installation (30 September – 25 February 2018) will feature the artist and her friends. Stemming from a conviction that to learn to be oneself, one always needs others, the film is shot at a construction site for an expansive and modernising Jain ashram in India. Each invented situation explores the interconnections and tensions between an individual and her community, solitude and gregariousness, genius and collaboration, repose and performance. Neither psychological probing nor spiritual collectivism – in short, science or religion – can fully address and encompass human desire. 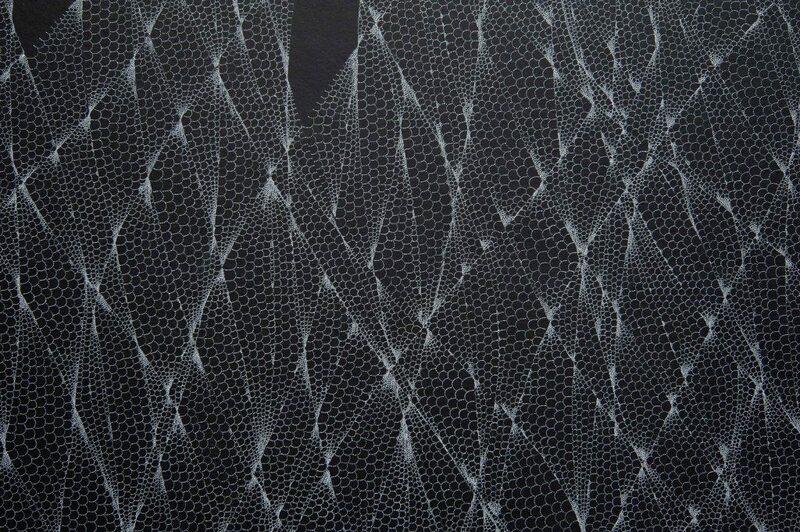 Waqas Khan’s minimalist ink drawings are made from networks of extremely precise dots and lines that measure less than a centimetre each. 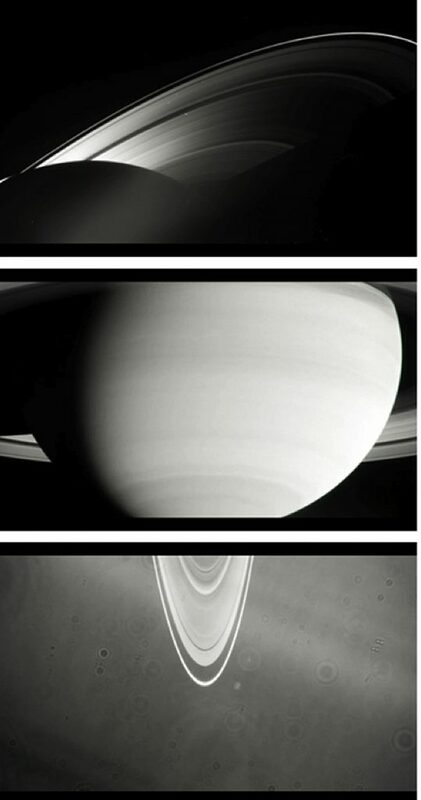 He creates expansive monochrome compositions that resemble webs and celestial expanses. Working at night, he enters a trance-like state in which he controls his breath to match his mark-making. His work is inspired by Sufi stories and songs, ‘I deal with the script of the Sufi. It’s a side of Islam that is peaceful, happy. For me, Sufism is like meditation, that kind of calm’. 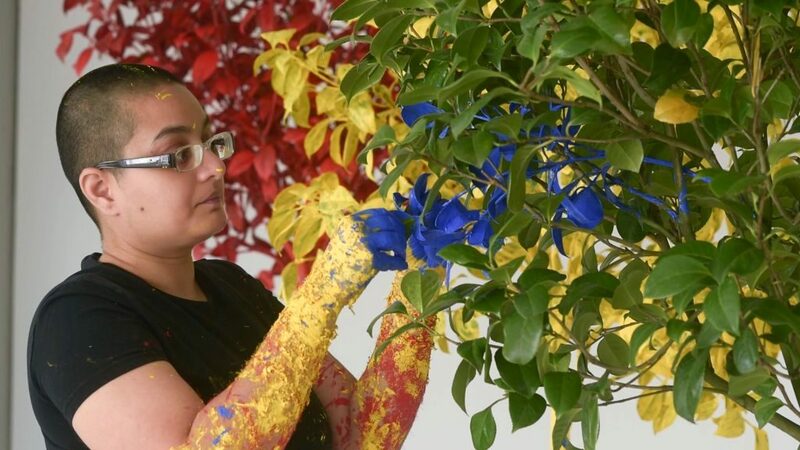 Mehreen Murtaza will fill Manchester Art Gallery’s ground floor gallery (30 September 2017 – 4 February 2018) with living plants for a new work exploring communication and consciousness. Through in-depth research, Murtaza has developed a unique narrative and sound installation which will blur the boundaries between plant neurobiology, science fiction, philosophy and spirituality to create a space that is neither fiction nor non-fiction. Multi-disciplinary artist Hetain Patel will exhibit two video works, The Jump (2015) and Don’t Look At The Finger (2017), a new commission by Film and Video Umbrella with Manchester Art Gallery and QUAD (30 September 2017 – 4 February 2018). Continuing the artist’s fascination with staging archetypal Hollywood action scenes within domestic settings, each piece employs the artist’s characteristic sense of humour and the scale of a Hollywood production. Don’t Look At The Finger presents a wedding ceremony where bodies speak physically, and the protagonists seek human connection through ritual combat and signed languages. The Jump features Patel’s homemade replica Spider-Man costume and connects the fantasy of action and superhero films with the domestic setting of his British Indian family home in Bolton. Risham Syed’s solo presentation (30 September 2017 – 25 February 2018) will consist of new postcard sized paintings of Lahore, exquisite mementos of the artist’s home city. Juxtaposed with lifesize objects from the construction industry such as iron rods or spiked grills, the exhibition will show a city in constant flux. Additional sculptural works that reference collective memory and colonial history will be installed in dialogue with the galleries 18th and 19th century permanent collection. On 30 September at 2pm Tentative Collective will host a performance-lecture in response to their home city of Karachi. Concentrated on three brothers, who continue to work for a family business Ahmeddin and Sons, making immaculately handcrafted caps, the project engages with notions of progress and development, shifting economies, and the changing pace of a globalised, neoliberal city. New North & South – From 29 September to 1 October 2017, the Museum of Science and Industry will welcome performance artist, Nikhil Chopra. Chopra will create a one-off, 48hour performance based around steam locomotive 3157 in the museum’s Power Hall. The engine, built in 1911 at Newton-le-Willows, Merseyside was exported to countries of the former British Empire. Serving on the North Western Railway of India this locomotive was transferred to Pakistan Railways after Partition in 1947 where it ran until 1982. 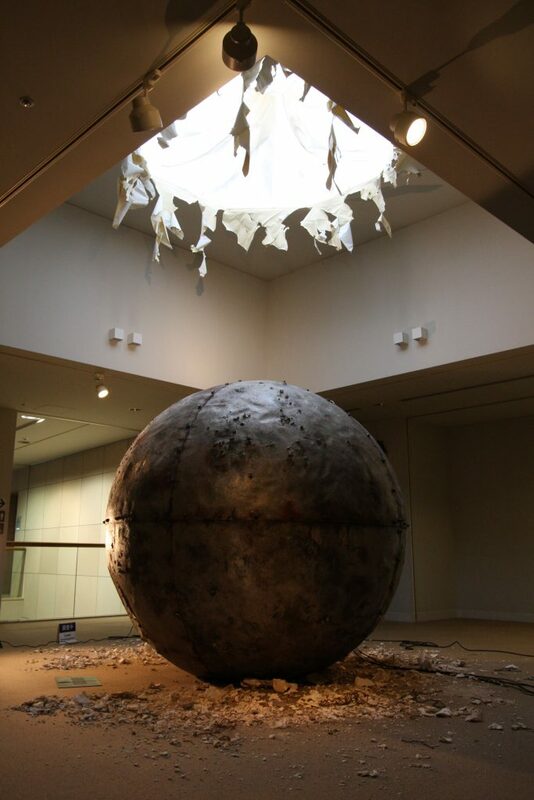 This historic object will form the symbolic centre of Chopra’s performance. Famous for long-duration performance pieces, Chopra’s work will include changing costumed personas; intricate, detailed graphic drawing; and live music by DJ, Masta Justy. Open 24 hours a day visitors will be able to watch Chopra’s piece at any time during the weekend. 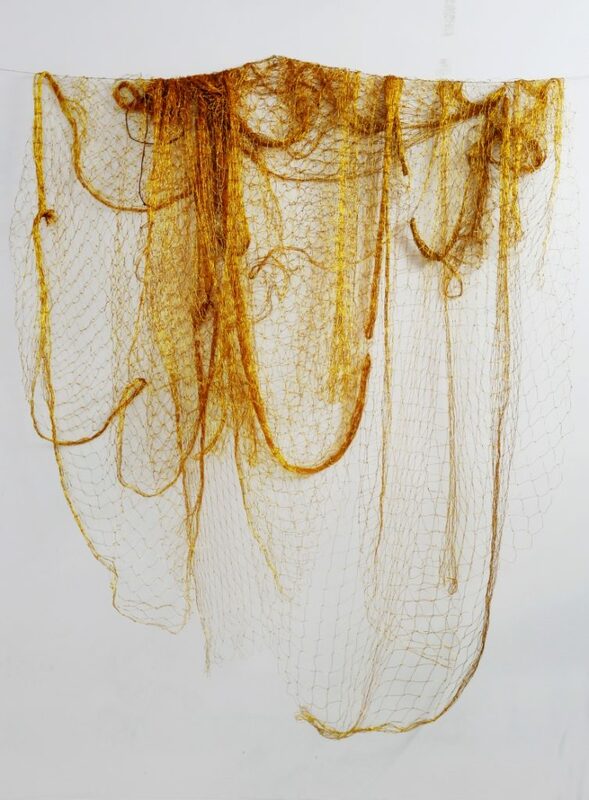 Yasmin Jahan Nupur, Golden Net, 2017. Courtesy of the artist. Reena Saini Kallat’s solo exhibition Earth Families at Manchester Museum (29 September 2017 – 26 February 2018) will interact with the museum’s rich and varied natural sciences and human cultures collection. Drawing together multiple strands of objects and specimens to invoke dense histories of human exchange and combat, coercion and conquest, Kallat creates new hybridised species of birds and animals, trees and flowers from national symbols proclaimed by nations as their own, symbolically unifying the otherwise conflicted nations they represent. The Oak tree of the USA is combined with the Palm tree of Cuba, the national bird from Israel the Hoopoe alongside the Palestinian Sunbird. 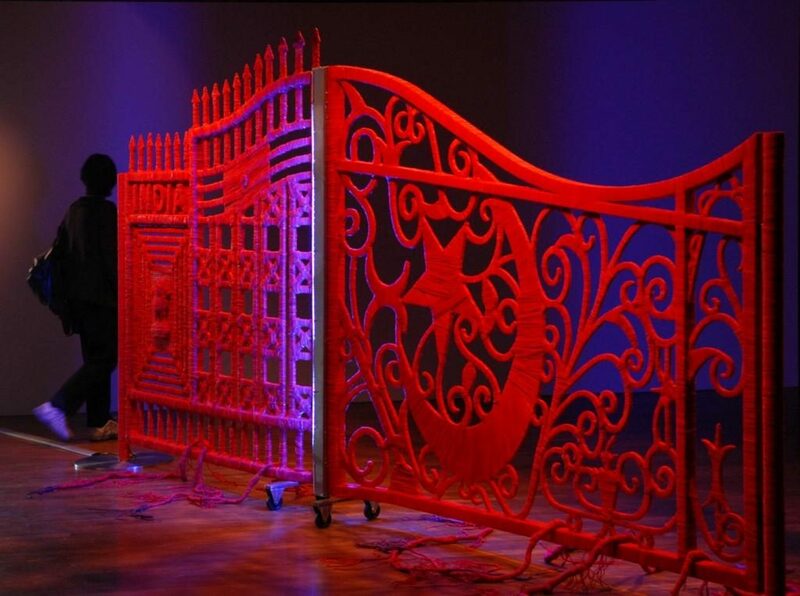 Kallat will also exhibit Colour Curtain (2009), a barricade made from rubberstamps with the names of individuals who have been denied visas and Light Leaks (2008-2010), a sculpture modelled on the gates at the Wagah Attari border between India and Pakistan. Alongside the exhibitions programme throughout September multi-arts centre HOME will showcase independent Indian cinema and Manchester-based Band On The Wall will programme a series of contemporary South Asian music events. The New North and South network consists of Manchester Art Gallery, the Whitworth, Manchester Museum, Liverpool Biennial, The Tetley in Leeds and Colombo Art Biennale (Sri Lanka), Dhaka Art Summit (Bangladesh), Karachi and Lahore Biennales (Pakistan), Kochi-Muziris Biennale (India) and the British Council. The three year project aims to connect with diverse audiences on both continents through a programme of exhibitions and events that showcase the best of contemporary art from Bangladesh, India, Pakistan, Sri Lanka and the UK. MANCHESTER ART GALLERY South Asian Design Until 10 June 2018 The Design Gallery features South Asian craft and fashion from India, Pakistan, Bangladesh and Sri Lanka spanning three centuries. Each country is famous for its vibrant regional costumes, luxurious textiles and intricately detailed ceramic, stone or metal ornaments. Colour and surface pattern are used with intensity inspired by subjects ranging from spirituality to food and from current affairs to kitsch. The exhibition explores how the region’s traditional crafts are inspiring contemporary art, design and fashion. International highlights include contemporary art by Adeela Suleman, fashion by Tarun Tahiliani and Manish Arora and product design by Cobalt Studios, Rubberband and Tippoi. MANCHESTER MUSEUM Memories of Partition 15 August 2017–January 2018 Find out about the experiences and legacies of the creation of India and Pakistan in 1947, through the memories of members of Manchester’s South Asian communities. The partition of India led to the largest mass migration in human history, with an estimated 15 million people being displaced. The world-changing impact of partition remains relatively unexplored by museums across the UK. Memories of Partition will address this by revealing the untold stories of partition on local communities, multiculturalism and migration. the creator and remover of obstacles. Standing on a lotus pedestal, Ganesha is depicted with a lion mask above his head, snakes as anklet. 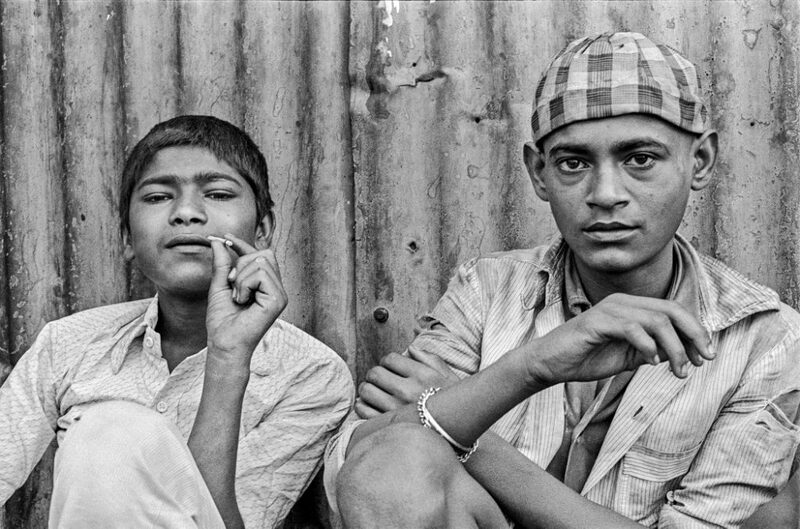 THE WHITWORTH Sooni Taraporevala: Home in the City, Bombay 1976–Mumbai 2016 Until 28 January 2018 Sooni Taraporevala: Home in the City, Bombay 1976 – Mumbai 2016 at the Whitworth is the first UK solo exhibition by photographer, screenwriter and filmmaker and Sooni Taraporevala. The exhibition is organised in collaboration with Sunaparanta, Goa Centre for the Arts. Presenting life in Bombay/Mumbai from 1976 to the present day in 30 black and white photographs the exhibition has been guest-curated by Siddharth Dhanvant Shanghvi, for Sunaparanta, Goa Centre for the Arts, with patronage from Dattaraj & Dipti Salgaocar. Beyond Borders Until 3 June 2018 Beyond Borders explores South Asian textiles bringing together four artists Raisa Kabir (England), Yasmin Jahan Nupur (Bangladesh), Risham Syed (Pakistan) and CONA (a Foundation, artist-driven, not-for-profit, based in India bringing together works connected to the development and intersection of art and design from the Weavers Service Centre in India) working on issues around post-colonial identity, ruptured spaces, authenticity, displacement and belonging. These artists who are based in Pakistan, India, Bangladesh and England have developed works around these concerns, experimenting with a range of media including textiles, fibres, embroidery, film, photography and performance. The exhibition highlights the changing landscape of the subcontinent in the twenty first century, post-independence and partition and showcases new work. Each new work is debuted alongside historic textiles from the subcontinent in the Whitworth’s collection as well as fashion and decorative objects from across the Manchester Art Gallery and Museum partnership. In 2018 Yasmin Jahan Nupur will return to the Whitworth for a performance piece.